Since the launch of the G5 counter-terrorism task force by Mauritania, Mali, Burkina Faso, Niger and Chad, Algeria has shown little if no support for the initiative, which it deems as a move by France to boost influence in what Algiers would love to become its backyard. Algeria’s stand against collective regional security efforts stands in stark contrast to Morocco’s support for multilateralism in countering the terrorist threat in the region. Sahel countries have on multiple occasions deplored Algeria’s laxity with Iad Ag Ghali who facilitated the merger of four terrorist groups operating in the Sahel into one group pledging allegiance to Al Qaeda and its Jordanian leader Azarkawi. The four terrorist groups were brought together under the command of Ag Ghali. The new terrorist organization bears the name of “Jamaât Nasr Al islam wa Al mouminin” (Group for the Defense of Islam and the Muslims). Despite strong presence of G5 soldiers along with French and American troops, no senior terrorist leader could be arrested in the region leaving doubts that terrorist groups have found safe haven in the Algerian desert. Analysts see that Algeria has been manipulating terrorism in the region for three main reasons. First, connivance between Algerian security services and some terrorist groups dates back to the black decade in the 1990s where domestic intelligence service (DRS) used extreme GIA members to discredit the FIS Islamists. Later, with the disbanding of the GIA and its retreat to the mountains and the Sahara, Algeria’s security operations pushed these terrorist remnants of the black decade to operate in the Sahel where they engaged in trafficking and criminal activities. Algeria has also used terrorist leaders in the Touareg community such as Iyad Ig Ghali to thwart nationalist ambitions of the Touaregs in Mali who were on the verge of establishing a state they call Azawad. Algeria, which has a large Touareg community of its own, will never allow the establishment of a Touareg state in Northern Mali. It found in terrorist groups led by Iyad Ag Ghali a much-needed ally to discredit the Touaregs. Long shunned by the West during its bloody 1990s civil war, Algeria saw in the September 11, 2001 attacks a chance to forge a new alliance with the US in the fight against terror. Hence, Algeria rejects multilateral security initiatives to keep the upper hand on counter-terrorism effort in the region in implementation of its regional hegemony attempts of becoming the West’s single interlocutor when it comes to security issues in the Sahel. Algeria’s unilateral approaches and patronizing attitude with its Sahel neighbors have so far backfired. Instead of being invited to key security meetings, Algeria is isolated more than ever by its Sahel neighbors. The creation of the G5 force has put the final nail in Algiers-led Regional Command for Joint Counter Terrorism Operations (CEMOC), set up in 2010 with headquarters in Tamanrasset with the participation of Mauritania, Mali and Niger. The CEMOC has strikingly failed in accomplishing its goals of cracking down on terrorist groups largely due to Algeria’s reluctance to grant other countries’ forces the right to pursue terrorists in its territories. The creation of CEMOC was a failed attempt to assert regional hegemony rather than fight terrorist groups. Seven years after the establishment of CEMOC, Algeria’s genuine purposes became evident: keep France away from the Sahel and contain its archrival, Morocco. Building on its strong economic and historical ties with West African countries, Morocco has been able to develop a multi-pronged foreign policy that gives priority to addressing the Sahel’s security issues. Even prior to its return to the African Union, Morocco built strong ties with G5 countries where Moroccan financial and telecom agencies have been operating for decades. The North African Kingdom has stressed on multiple occasions the need for multilateralism and cross border cooperation to counter the terrorist threat and has offered military training and support to G5 countries. 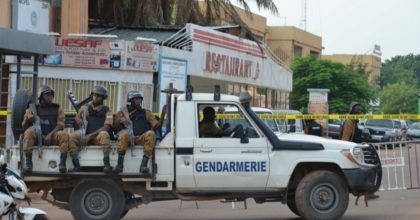 On the backdrop of recently improved relations with Mauritania, Morocco considers Sahel security an extension of its own security. The kingdom identified border security, food security, social development, military training, and religious training for imams as key areas of action in the Sahel. In June 2018, Morocco pledged support for the G5 Sahel joint force whose operations focus on counterterrorism and combating transnational crime. Rabat has also used soft power to boost its clout in the Sahel as a destination for West African students offering grants and professional training to Sahel citizens. Likewise, Morocco wants to play an important role in the energy field. During the G5 Sahel group’s December 2018 meeting, Prime Minister Saad Eddine El Othmani announced Moroccan plans to support the Priority Investment Program. Rabat intends to provide access to its electricity and water management expertise through the country’s top two state-owned renewable energy agencies—the Moroccan Agency for Sustainable Energy and the Moroccan Agency for Energy Efficiency—in order to bring electricity to the underpowered Sahel. Morocco’s increasing economic integration with Sub-Saharan Africa implies an increasing security engagement in the Sahel where cross-border counter-terrorism action is more needed than ever.